The Permanente Journal is a MEDLINE-indexed, peer-reviewed journal of medical science, social science in medicine, and medical humanities published by The Permanente Press based in Portland, OR. Free full-text access is available online. We welcome submission from all disciplines related to medicine. The Permanente Journal practices a continuous electronic publication model. The online journal is the version of record (ISSN 1552-3775), with articles published on our Web site with an epub date and full-text citation, and regular deposits to MEDLINE. The Permanente Journal (ISSN 1552-5767) is published in print quarterly (February, May, August, November). 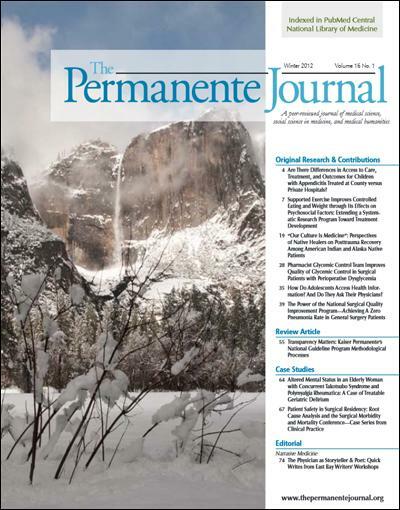 The Permanente Journal conducts single-blinded peer review on all published articles and strives for a 100-day decision-to-publication schedule with a goal of 30 days from completed submission (all required forms completed and manuscript assigned to an Associate Editor for review) to first decision. The Permanente Journal seeks to advance knowledge in scientific research, clinical medicine, innovative health care delivery, and medical humanities through publication of high-quality, peer-reviewed articles, and to promote the betterment of public health. The journal’s objectives include maintaining high standards of editorial integrity independent of special interest; publishing peer-reviewed articles on a diverse range of medical topics; fostering consideration of important issues affecting medicine, health, health care, health policy, and health care delivery; achieving a high level of ethical medical journalism that is timely, credible, and enjoyable to read; sharing a multidisciplinary study of medical practice and health care; and considering a broad range of scholarly contributions, including original research, review articles, clinical articles such as case reports and image diagnosis articles, commentaries and editorials, narratives in medicine, and medical humanities.